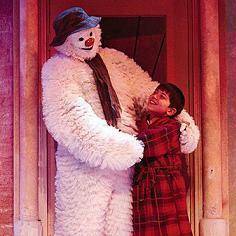 Now a major fixture in the Christmas calendar, Raymond Briggs’ seasonal favourite, The Snowman returns to delight children of all ages at the Peacock Theatre, London and we had The Snowman Theatre Breaks from 23rd November 2016 to 1st January 2017. The Snowman has melted for another year! When a young boy’s snowman comes to life on Christmas Eve, the two of them set off on a night-time quest for adventure. On their travels, they meet dancing penguins, reindeer and, of course, Father Christmas. Is it magic, is it trickery or can the Snowman really fly? You tell your children what you like, but they’ll belive he can, as he escapes the clutches of the evil Jack Frost to return home for Christmas morning. This production is suitable for all children aged two and upwards. Featuring Howard Blake’s beautiful Walking in the Air, performed by a live orchestra and is a truly captivating mix of dance, stagecraft and music completing a magical Christmas fairy-tale Theatre Break. IMPORTANT – Please note that Strobe Lighting is used during this show. Performance times : Tuesday to Sunday at 1900; Saturday & Sunday 1100 & 1430; Extra performances during school holidays.